In a bid to eat a bit healthier and without feeling like we are following a diet we have decided to go ‘Low GI’ from tomorrow. 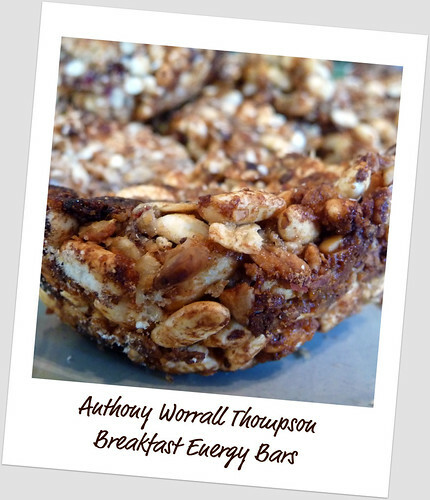 I have made these energy bars for us to have for breakfast. Neither of us ever bother with breakfast so I thought these would be good to just grab and go. 1 – Preheat oven to 180c/350f.gas mark 4. Spread coconut on a baking tray and cook for 10 mins until lightly toasted. 2 – Finely chop the dried fruit. 3 – Put the oil, peanut butter & honey into a heat proof bowl in the oven for 1-2 mins just until they are easy to mix. Stir in the vanilla extract. 4 – Mix all ingredients together and press firmly into a lightly oiled shallow 19cm square tin. Bake for 20 mins and then press lightly again. Leave to cool in the tin. This is the start of #3 on my 101 Things in 1001 Days list…..cook 1 thing from every cookbook that I own.